Chinese New Year is only a week away, falling on the 5 February 2019! We want everyone to have the most enjoyable and memorable celebrations, so here are a few ways to celebrate Chinese New Year in London. Whilst Chinese New Year falls on Tuesday 5 February 2019, the main Chinese New Year festivities in London will take place on Sunday 10 February 2019! Apart from Asia, London is the biggest Chinese New Year celebration in the world! Marking the turn of the lunar year, Chinese New Year has been celebrated for centuries and is one of the most important holidays in China. People welcome spring and what it brings along: new beginnings and fresh starts. Every year, hundreds of thousands of people descend across Chinatown and the West End to enjoy a colourful parade, free stage performances and traditional Chinese food – all organised by The London Chinatown Chinese Association (LCCA). There will be celebrations across the West End, starting at Charing Cross Road, all the way through to Trafalgar Square. Welcome in the ‘Year of the Pig’ at the Chinese New Year Parade that fills most of the West End with music and activities. 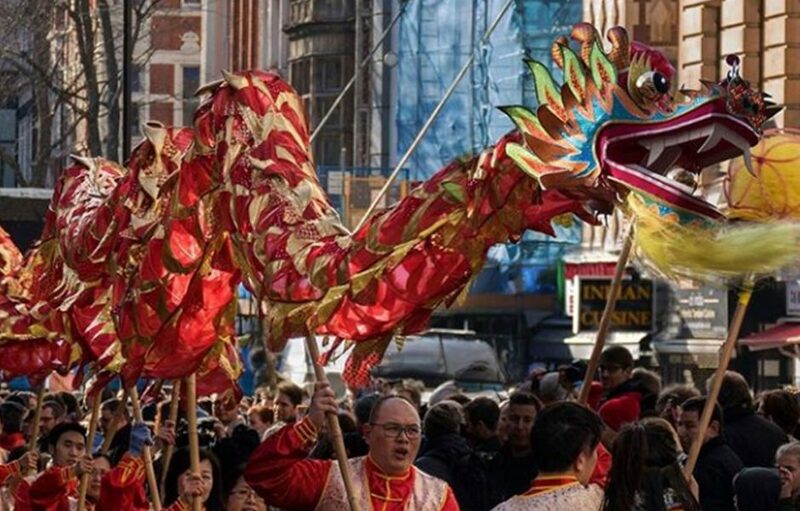 This will kick off with dragon and lion dances and handcrafted, colour floats in Charing Cross Road at 10am, before going through Shaftesbury Avenue in Chinatown. Experience traditional dragon and flying lion dances, ahead of fun-filled stage performances including Chinese dance and music shows, acrobatics, Chinese rock hits, interactive dance sessions and an exciting line-up of artists from China. There will also be street food dishes from the stalls lining the square throughout the celebrations so you can experience a taste of the Far East. The Chinese New Year festivities continue across the West End with performances, workshops and activities, including family-friendly entertainment. Calligraphy workshops, dressing up and performances are part of the festivities planned for the Leicester Square family zone. Between 12pm-6pm in Chinatown London you’ll find lion dancing, craft stalls and a full range of Chinese New Year festivities. You will also be able to sit down for a traditional Chinese New Year meal and enjoy festive treats in one of Chinatown’s restaurants. Remember to wear an item of red! Red is the key colour of Chinese New Year – this will bring good luck for the coming year! Make sure to also follow the official #CNYLondon hashtag on social media for updates during London’s Chinse New Year festivities, and for you to share your photos! If you need help planning your travel for Chinese New Year, please see Visit London’s travel guide.